Shiraz will usually bring to mind, a deeply fruity red wine which can pack a punch, but the Shiraz I have in mind relates to the city of poets and literature, and the Persian and Lebanese restaurant on Walter Road. The Persian Empire when at its most expansive extended to Egypt, Greece and Turkey which explains the Mediterranean influences found in this Middle Eastern cuisine. It’s a healthy combination of rice, bulgur wheat and flatbreads with meat, poultry and fish, but with the addition of spices which bring warmth rather than heat. A trip to Morocco some years ago started my love of delicately spiced food. I learnt how the addition of a tiny amount of saffron could bring a very subtle flavour to an otherwise everyday chicken tagine. Saffron is the dried stigma of the crocus flower, and each flower produces 3 stigmas which explains why saffron, is the most expensive spice in the world. You will find tiny little packs of saffron for sale in supermarkets at about £3 per gram, but if you are heading to Spain this year look out for it – it makes a far better holiday souvenir than a toy donkey, and it will make your paella taste wonderful. Other ingredients you’ll find in Persian cuisine are rose petals, dried limes, cinnamon, ginger, pomegranate and sumac. The latter is the ground up berries of the bush of the same name – it adds a lemony tang without the need for lemons. I sprinkle it onto home-made hummus along with a glug of olive oil. In Indian cuisine they use a mix of spices called garam masala – in Morocco it is ras el-hanout and in Persia it is advieh, a mix of cinnamon, turmeric, ginger, cumin, caraway, coriander, cloves and cardamom. Every home cook will have their own version. Another spice blend that is essential in Persian cuisine is za’atar. This is a blend of thyme, sesame seeds, sumac, oregano, cumin and marjoram ground to a fine powder. I love to simply dip bread into olive oil and sprinkle the za’atar on top – a bowl of olives and a pot of hummus and I am a happy girl. The first thing you notice on entering Shiraz is the welcome you are given. We popped in on the off-chance that we could get a table, following a spur of the moment decision to eat out, but the smiling waitress made us feel as if we had been regular customers for years. Once seated and our drinks ordered, we made our choices off the a la carte menu, although there was a very attractively priced set menu with a good selection to choose from. I love hummus and often make it at home. It’s the way its tahini-rich tang balances the creaminess of the chickpeas – the perfect accompaniment to grilled flatbread and olives. We added in some chicken wings and could probably have eaten a portion each – they were plump and juicy with the tell-tale charred edges that only a very hot grill would give. Lamb chops are a family favourite, but they have to be cooked just so. The meat must be pink and moist while the fat has to be crispy and well – not fatty. Here again a hot grill is essential. 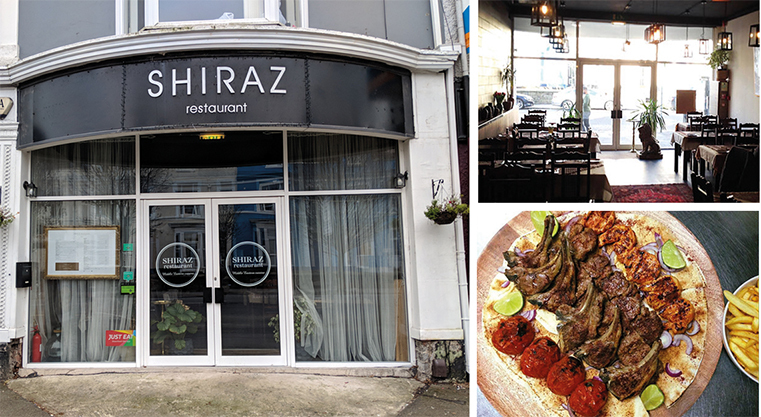 Shiraz’s Dandah kebab Riyash or grilled lamb chops were bang on the money – they had been marinated to make them succulent and then charred to perfection. A simple Tabbouleh salad completed my meal – this consisted of bulgur wheat with lots and lots of fresh parsley – the perfect foil for the richness of the lamb. Mr W completely threw me a curveball when he ordered the sea-bass. My carnivore husband ordering fish – I wasn’t expecting that. But, he certainly made the right decision as this bass was a surprisingly meaty feast. Two huge fillets of prime fish simply grilled with a scattering of fresh herbs and served with a large portion of golden chips – some things never change. Pop in to Shiraz next time you’re looking for spice without the heat – it’s vegan and vegetarian friendly too. I hold my hand up and admit that I am not a great fan of going out for Sunday lunch. I know that the Great British Roast is voted the nation’s favourite meal in so many polls, but the combination of overcooked vegetables and gravy smothered roasted meat just doesn’t float my boat. Plus, I also balk at the expense of a restaurant versus cooking at home, especially when there is a crowd to feed. However, on this occasion it was a visitor to Swansea who wanted to experience the 360° views over the bay, only available from the Grape and Olive at the top of the Meridian Tower, so an exception was made. We were shown to our table by a charming young lady, who looked after us for the whole afternoon. The attention to staff training is very evident here. There is no denying that the view is impressive, or at least it was for about 20 minutes before the rain came in and obliterated the lot – Mumbles head disappeared into the mist along with Kilvey Hill – which meant that we could concentrate on the menu. General consensus of opinion was that we should have a proper Sunday roast, and I was outnumbered so went with the flow. 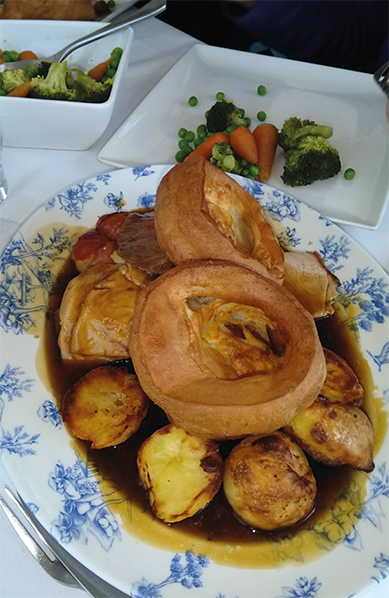 The sharing platter for 2 meant that we got to try all the roast meats that were on offer, beef, loin of pork and turkey breast; these came accompanied by Yorkshire puddings, stuffing balls, pigs in blankets, goose fat roast potatoes, fresh vegetables and gravy. The platters arrived and were beautiful blue and white china – proper traditional meat plates – known as turkey plates in our house for some unknown reason. The vegetables were certainly not frozen – the chantenay carrots still bore their skins and the broccoli was a vibrant green – maybe the peas were frozen but even the best chefs agree that they are best picked and frozen immediately. The food, well it certainly exceeded my expectations. If I was being really picky I would have liked my beef to be rare and to have had some brown turkey meat, but that would be picky. At just £12.50 a head it has to be pretty good value for a meal out, but the little devil on my shoulder is still saying that for £50 I could feed a crowd of people a roast rib of beef and all the trimming and still have beef left over for sandwiches the next day. So, have I changed my mind about going out for Sunday lunch? Possibly – the Grape and Olive certainly provides the perfect location for a lunchtime meal given that the view is only visible during the day unless you’re looking for a nightscape. The washing up is taken care of and there is service with a smile – maybe I can be persuaded occasionally.